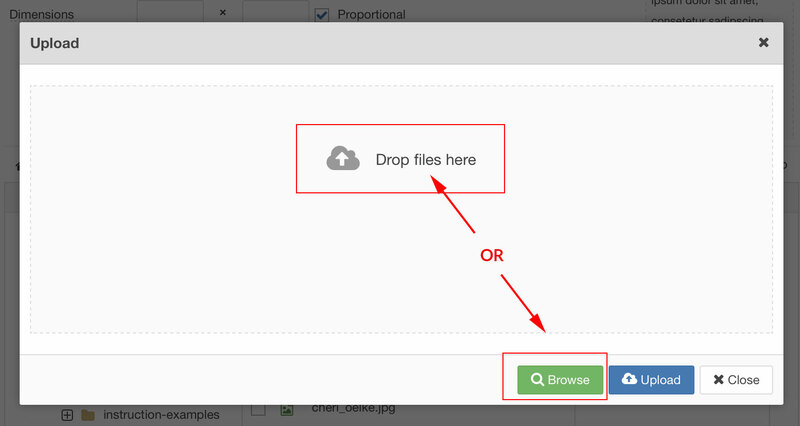 Save your photo image file to a folder on your Desktop or in a location you can easily browse to. Type your artist's introduction in a text program such as Notepad (Windows), TextEdit (Mac) or Word. Save this to the same folder as your photo file. If you are ready to add it to your gallery, you can just leave the file open so you can come back and copy the text. 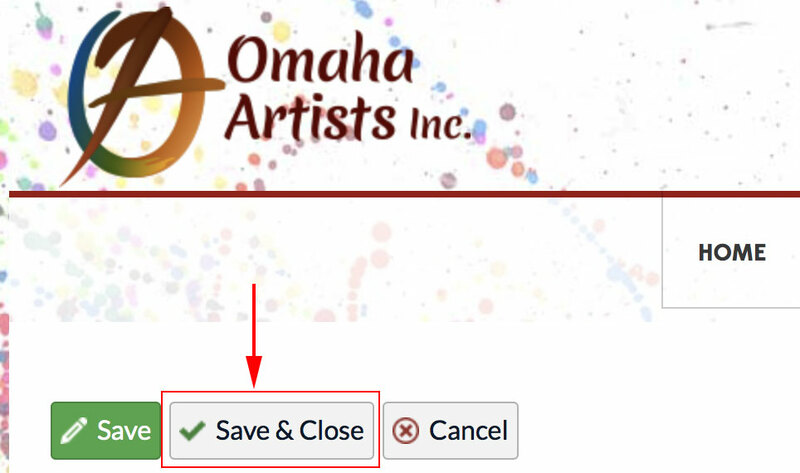 Click on the Galleries link in the main navigation bar at the top of the page below the Omaha Artists Inc. logo. Click on the Manage Gallery link located under Galleries Menu on the right side of the page. (See Access Your Gallery Page for details). Your name will be where it says "Your Name" in the image below. Click on your name to open the page to add your photo and introduction. On the page that opens, scroll down to the Description editor box. Do not change or add content to any of the boxes that come before Description. Switch to the folder that contains your files and open the text file that contains your artist's introduction. 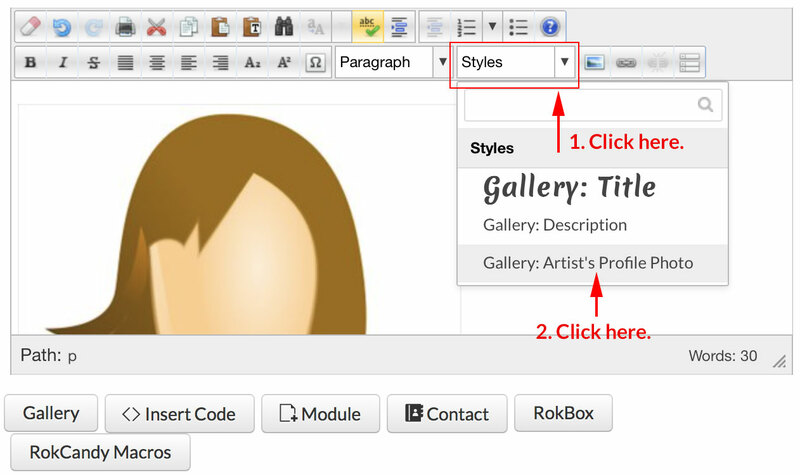 Select the text, copy it and switch back to the Description editor box for your gallery page and paste the copied text. The copied text may have formatting code that is invisible to you that needs to be removed. Select all the text you just pasted and click on the icon in the toolbar that looks like an eraser (see image above) to remove the formatting. This will not delete your text. It will remove bold and italic styling. You can add this back by using the style icons at the top of the editor box (seen under the eraser icon in the image above). If you are not adding a photo of yourself, you can click on the Save & Close button at the top of the page and move on to Add Gallery Images. Add a Return space at the beginning of your the text to add an empty line. Click to place your cursor inside the empty line. 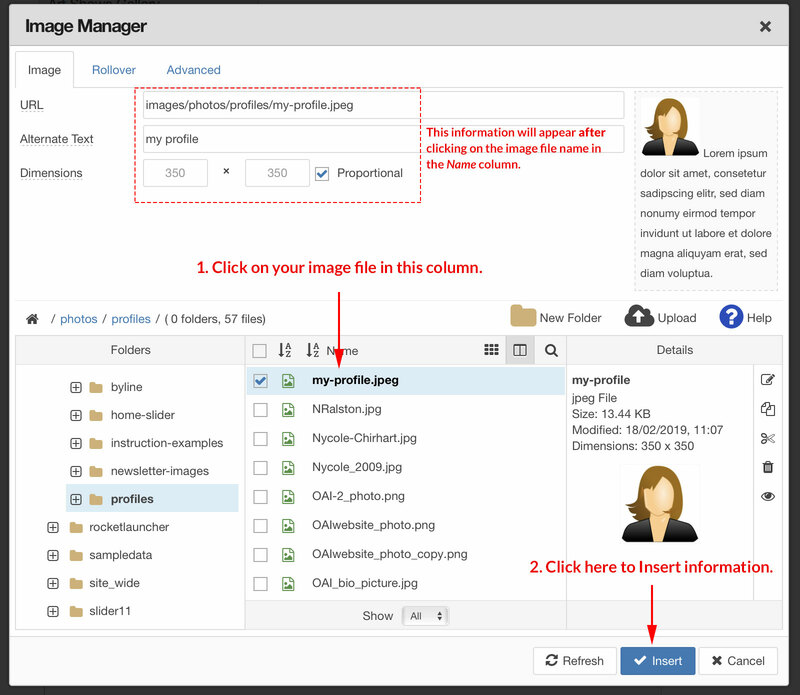 Click on the Insert/Edit Image icon to launch the Image Manager. At the bottom of the Image Manager window, you will see three columns. Under the Folders column on the left, click on the photos folder to expand the folder's list. Click on the profiles folder in the expanded list. Click on the Upload icon just above the Details column to open the Upload window. Click on the Browse button and navigate to the folder on your computer that has your photo file. Select your photo and click on the Choose button or you can drag the photo file from the folder it is in onto the window instead. The photo file name will appear in the Upload window. Click on the Upload button. The photo file name will be highlighted in the middle Name column. Look at the preview image in the Details column to confirm it is the image you want to use. If the image preview shows the image you want, then click on the highlighted image file name in the Name column. 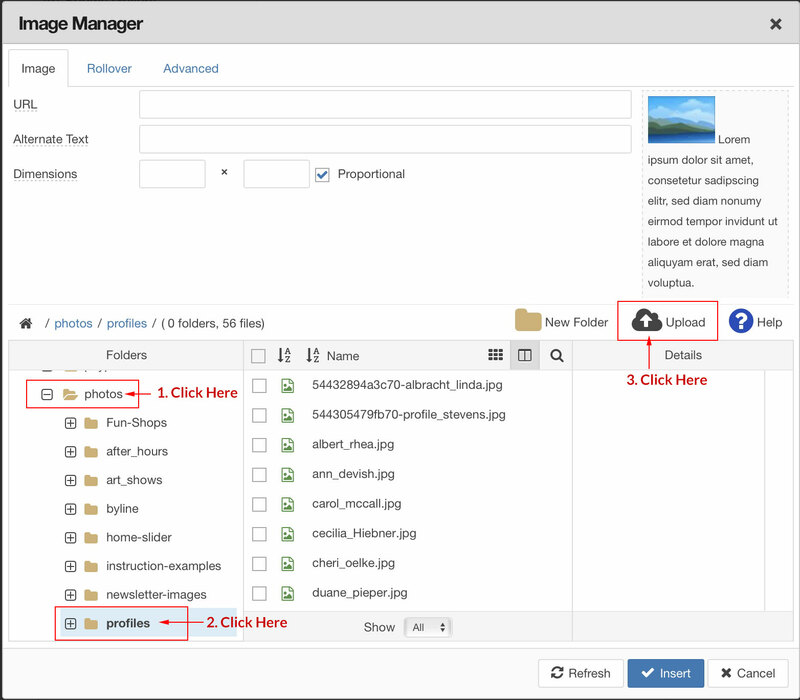 This will add the image information in the URL box at the top of the Image Manager. If it is not the image you want, just repeat the process for uploading an image. Don't worry about the incorrect file. Click on the Insert button. If you get the message A URL is required., click on the OK button and then click on the image file name in the Name column. This will fill in the URL box. Your photo will be placed on the empty line above your intro text in the the Description editor box*. Check that the text is showing below your photo. If it is showing next to the photo, click in between the photo and the text to place the insertion point and hit the Return key. * Depending on the size of the photo you are using, it may appear very large inside the Description editor box. The next step will fix the size. Select Gallery: Artist’s Profile Photo. 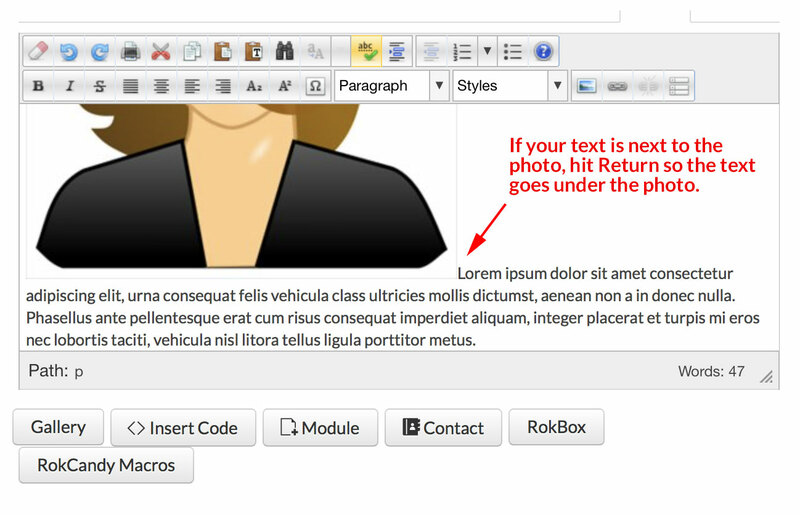 If your photo and text are not formatted similar to the image below, click on the Undo icon and return to Step 10 above. Scroll to the top of the page and click Save & Close. This will bring you back to the Manage Your Gallery page.